The cycle of the year is the cycle of life. In the fourfold unfolding of the seasons we see the primal patterns at work in nature - and therefore in our own nature. The outer manifests the subtle changes of the inner, so that in looking at the seasons we also look at a perfect mirror of ourselves. Our nature and the nature of nature are the same. Reflecting on it and attuning to it is a conscious celebration of the power, wisdom and love inherent in all life. From the darkness of winter, tomb-womb of the year, to the lightening and enlightening days of spring, from the stillness of reflective power to its crick-crack bursting into directed action; from the glory days of summer, time of greater growth and lingering light, to the cornucopia of the harvest, autumn’s balance-sheet, the reckoning time, rich in fruit and seed. These four manifestations of life’s encircled unity show us in their unstinting and unceasing flow how to live in self-renewing harmony within ourselves, in our interaction with others and with the natural world of which we are an intrinsic part. Our lives are largely governed by our relationship with the sun, giving us the activity and rest of day and night and the sequential seasonal changes that cycle through the year. The four archetypes of the longest night at the Winter Solstice, of equal day and night with light rising at the Spring Equinox, of the longest day at the Summer Solstice and of equal day and night with light fading at the Autumn Equinox give us the major turning-points known, marked and celebrated by cultures world-wide for millennia. Divide these four into eight and we have the eight key points of the year, so that every six weeks or so a new phase begins. The changing balance in the hours of light and darkness, of heat and cold, establishes different patterns in the weather, in cycles of growth and decay, and within ourselves. Embedded in nature, we can use these natural cycles with their rhythmic regularity as keys to unlock processes within as well as without and so establish and maintain harmony. From the nadir of the Winter Solstice the year rises through Imbolc, the Spring Equinox and Beltane to reach its zenith at the Summer Solstice. Then Lammas heralds the harvest of the Autumn Equinox and Samhain opens the door to the underworld and we return once more to the Winter Solstice. A brief study of this primal cycle follows, outlining the key features of each stage. Autumn Equinox (September 22/23) This is the start of the Druid year, when day and night are equal. The harvest festival, when the power of heaven is infused into the fruits of the earth, and you reap what you have sowed. You see the full reality, what you made of your dreams, projects and plans, the actual reality, the truth that gives understanding and wisdom. The start of the academic year, of inner work, of assimilation and unbiased reflection that will later be the proper basis for the choosing and sowing of seeds. The auto-tombing process of autumn, judgement day, Libra, sign of balance, cardinal air. Samhain (October 31/November 1) Thinning of the veil between the living and the dead, the visible and invisible worlds. Death of the external, the horror of rotting and decay. The popular version is seen in the monster masks of Hallowe’en, the black and the orange, the shrieky, squeaky ghosts and ghouls. All Souls Day, bonfire night, fireworks. Acknowledgment of the dark side. Acceptance and release. Letting the past leave. Old habits unwilling to die - look them in the eye, descent into hell, death and darkness, the underworld without which there is no spring resurgence. Decaying and dying to give space for renewal, recycling. Scorpio, fixed water. The Winter Solstice (December 21/22) is the longest night and the shortest day. Three days later, the rising sun can be seen to move northwards again from its most southerly rising point in the south-east. This is Christmas, when the Christ child is born from the Virgin Mother and the light returns. This sacred point of new beginnings in the heart of darkness is now often overwhelmed by the commercial festival and cult of the Christmas present, where the gift of the present tense, with all its virginal potential, is manifested and celebrated purely as material gifts. A time of going back home, the return from whence you came, to the origin itself, the reunion with the family that gave you birth, a time of sharing the present while remembering and honouring the past (old year) and preparing for the future (new year). Yule, child, seed or atom wrapped in its swaddling clothes. Capricorn, cardinal earth. Now the cold and dark of winter is fading, Imbolc (February 1/2) is upon us, the inner fire has survived the winter, it is Candlemas, the brightness of St Brigit’s Day. Imbolc is the time of choice, choosing what to do with the light, choosing what you want to commit yourself to. Valentine’s Day (February 14) is a modern echo of this, but it is not just for lovers, but for all who love life and want to make a difference. The brightening (Brigit-ening) days are a model for breaking with the old and affirming the new. The January sales are over. It’s time to get real. Aquarius, fixed air. The Spring Equinox (March 20/21) is the time of equal day and night, where the balance finally tips in favour of the light, as the cardinal fire sign of Aries fires up the year. Time of conscious seed-sowing, acting in the light. Sow those seeds and nurture them with purpose, plant your ideas with focussed attention and let the light itself unfold them. Mothering Sunday (Mother’s Day) falls around this time and reminds us to honour not only our own mother, but the mother of all mothers and the mother of all, without whom there is no creation and no renewal. On the Sunday nearest the first full moon after the Spring Equinox comes the Christian sol-lunar festival of Easter, when the resurrected Christ rises from the tomb to spread the light. In modern times the ancient goddess Eostre’s fertile eggs and rampant rabbits have been transformed into a harmless chocolate fest, sugar-sweet and bunny-twee. Next comes the time of Beltane (May 1), the old May Day and the modern May Bank Holiday, when the light is fast gathering pace, weaving new life and new forms in maypole colours and all of nature is alive with radiant beauty as the Queen of the May dances with Jack o’the Green. This spirit of harmoniously working together in groups is seen in International Worker’s Day or Labour Day. Taurus, fixed earth. Summer Solstice (June 20/21) Longest day and shortest night, symbolic rising of the golden dawn, not a group or a myth, not a hope or a dream, but the real flooding and receiving of the light of conscious awareness within. Time of greater growth and the drawing down of the light. At high noon symbolically the time of no shadow, where nothing is hidden and everything is out in the open. The axis of Stonehenge is aligned to the Summer Solstice sunrise in the north-east, where the sun can be observed to rise over the outlying Hele Stone, giving the most northerly rising of the sun. Father’s Day, honouring fathers and fatherhood. St John’s Day. Cancer, cardinal water. Lammas (August 1) First fruits, first loaf from the first harvest, where the initial results of endeavours can be seen. The announcement of the harvest. Time of holidays, relaxation, enjoyment, reaping rewards. Leo, fixed fire. This then leads into the full harvest at the Autumn Equinox and the cycle begins anew. The dates given are approximate, the exact date for a particular year being determined by when the sun is directly over the equator for the Spring and Autumn Equinoxes, the tropic of Cancer for the Summer Solstice and the tropic of Capricorn for the Winter Solstice (in the northern hemisphere). Astrologically speaking, these are the beginnings (0 degrees) of the cardinal signs of Aries, Libra, Cancer and Capricorn respectively, strong initial and initiating signs of fire, air, water and earth. 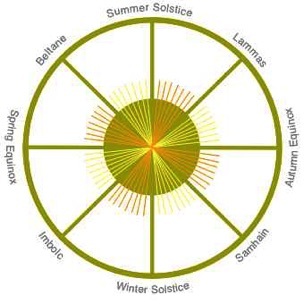 The four cross-quarter days of Imbolc, Beltane, Lammas and Samhain fall halfway between the equinoxes and solstices. Astrologically speaking, they occur at the midpoint (15 degrees) of the fixed signs of Aquarius, Taurus, Leo and Scorpio respectively, the four zoa of man, bull, lion and eagle. Astrologically their dates would then be around February 5, May 5, August 6 and November 7. However they are often celebrated in line with the calendar around February 1st, May 1st, August 1st and November 1st. Whether used for calendrical, agricultural, secular or spiritual purposes, this cycle of the year forms the basis of life’s ever-changing patterns with its regular rhythms and sequential transformation. The same patterns exist within a day (midnight, dawn, noon, sunset) and a month (new moon, first quarter, full moon, last quarter), these simple patterns layering to bring complexity when combined. Conscious awareness of nature’s workings brings attunement, alignment and unfolding within ourselves on a personal level, so that we can share and express its beauty and harmony.